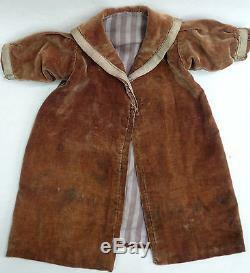 Adorable Antique Victorian Era Chocolate Brown - Infant's Swing Coat. Lined - Silk Velvet - Seersucker striped lining. 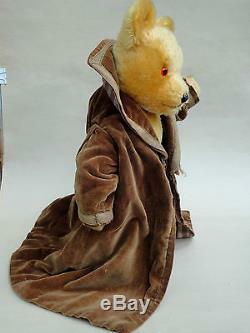 Great for a Teddy Bear or Doll display (teddy model NOT included). 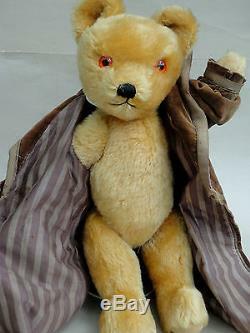 Fits 17 inch/44 cm tall Pedigree Teddy model as shown OR taller (teddy model NOT included). Chest 19 1/2 inches/50 cm (measured flat & doubled underarm to underarm). 17 1/2 inches / 45 cm long (back of neck to hem). 6 1/2 inches / 16 1/2 cm across back shoulders. 5 inch/13 cm inside circumference of cuff/sleeve hem. 5 inch/13 cm long underside sleeve. 3 inch/8 cm wide collar at back. 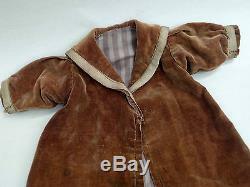 No nap wear, no surface fading to brown velvet or striped lining. 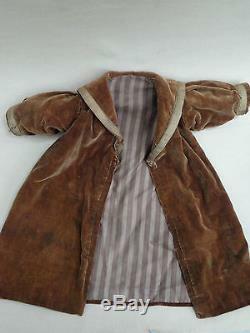 Some age darkening to silk collar/sleeve trim. Some darkened areas on exterior/velvet. 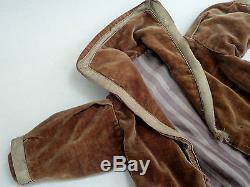 One small hole in velvet underside of one sleeve. 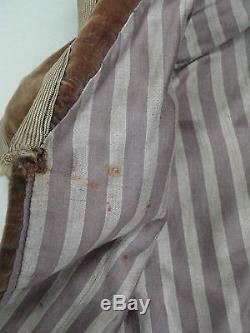 Hand sewn lining and trim, cuffs. Missing button and there are some oxidization marks on exterior and interior lining where metal button once was (adding a new button would cover this). 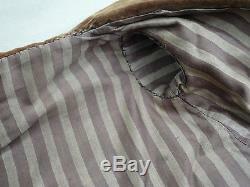 A little fraying at front ends of collar/trim. 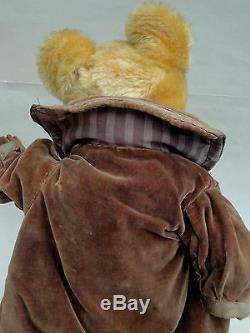 Sailor collar styling at back (squared), lined under side of back collar. 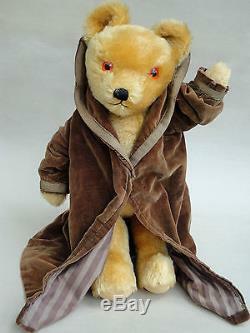 Shown modeled on 17 inch/44 cm tall Pedigree Teddy Bear (bear NOT included), and would fit taller bear/doll. 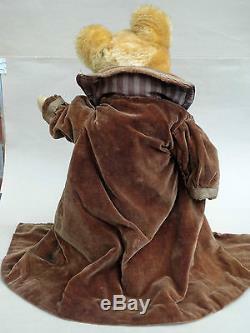 The item "Victorian c1880s Velvet Infant Swing Coat Chocolate Brown Lined Teddy Bear Doll" is in sale since Friday, July 08, 2016. 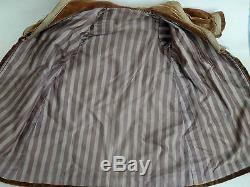 This item is in the category "Clothing, Shoes & Accessories\Vintage\Children's Vintage Clothing\Outerwear Coats & Jackets". The seller is "mandicrafts" and is located in Oakville, Ontario. This item can be shipped worldwide.